Glen Garioch distillery sits just outside the town of Oldmeldrum in Aberdeenshire’s fertile barley plains. 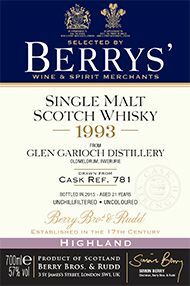 Founded in 1797, it is one of Scotland’s oldest distilleries and was revived in the 1970’s after a period of closure due to inadequate water supply. A new spring was discovered and production has remained constant since then. The attractive nose gives soft grassy notes with dried fruit skins and prominent orange citrus. A trace of smoke is evident on the palate and is carried along on a fruity magic carpet. This is a classy old sherry cask malt whisky with great poise.